For smart fiberglass attic insulation, you can be sure that Ultimate Radiant Barrier & Insulation has you covered. Our professional team of installers can help you get started on living in a more energy efficient home. Call us today to schedule a free in home estimate. If you want to reduce your cooling bills, you have to lower the amount of heat that’s coming into your home. The cooler you home, the less energy you consume, and one way of achieving this is with proper attic insulation. Without the right insulation, you may end up spending hundreds, even thousands of dollars a year on unnecessary cooling and heating bills. Fortunately, you don’t have to shell out hundreds of dollars every year on excess cooling bills. Blown-in fiberglass insulation ultimately creates millions of small air pockets which staggers the process of heat transfer. This means your home stays cooler during the summer months and warmer during winter. In turn, the air conditioning does not have to work as hard, and you save up to 17% or more off on your annual cooling bills. Most types of insulation require Houston homeowners to remove major structures in your attic. In most cases, homeowners end up tearing away most of the attic just to properly install the insulation. But let’s face it – not everybody’s willing to spend as much time, effort, and resources on attic insulation. That’s why Ultimate Radiant Barrier & Insulation specializes in providing affordable, turn-key insulation solutions for Houston homeowners with a constant focus on quality. Hassle-free installation – With blown-in fiberglass attic insulation, there’s no need to tear down every panel and divider in your attic. Installation literally takes only a couple of hours. Water proof – Humidity is your attic’s number one enemy. 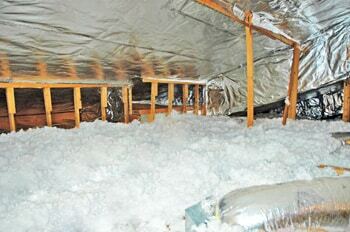 Fiberglass blown-in insulation does not retain moisture, so you know you have a dry attic. Durability – Install it, and forget it’s there. 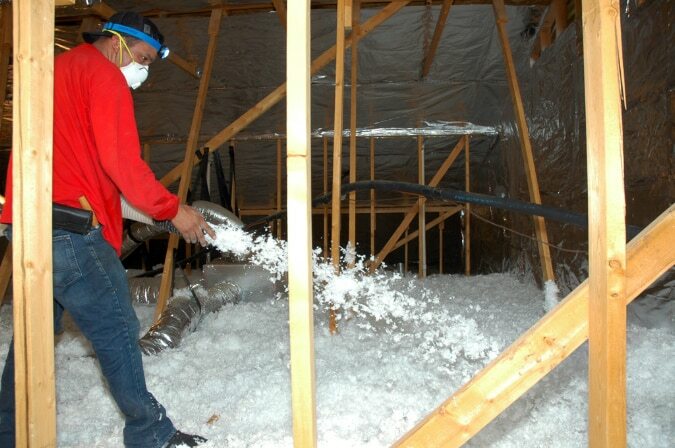 Blown fiberglass attic insulation can last anywhere from 10-15 years without maintenance. 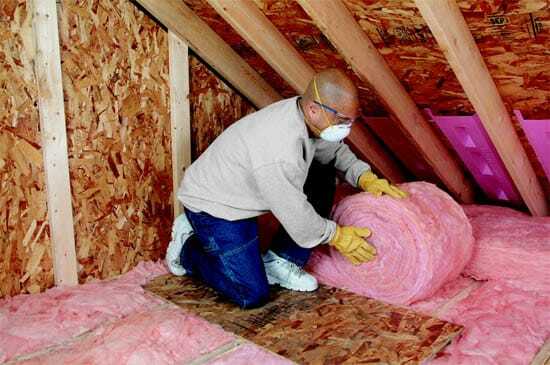 Affordable – Blown insulation is more affordable compared to all other types of insulation. And with R-values reaching up to 20-36, that’s quality insulation you can afford. Resistant to mold, humidity, and mildew – We use top of the line products, so there’s no need to worry about mold and mildew. Lower cooling costs – Ultimately, it’s all about lowering your cooling costs. See your cooling and heating costs lower by up to 17% by simply using blown-in insulation. Comfort – Because the indoor temperature is maintained, you don’t have to worry about your home being to dank or humid. Although blown fiberglass insulation is one of our most budget friendly types of insulation offered by Ultimate Radiant barrier & Insulation, we also have the tried and true fiberglass batt insulation. Most home will have this type of insulation in the attic and walls of their homes. We didn’t want to leave this one out and make you think that it wasn’t offered or wasn’t an option. Our fiberglass batt insulation is American Made and we stand by our products 100%! Strong and long-lasting: Pound for Pound fiberglass is stronger than sheet metal. Fiberglass has a high resistance to corrosion; it will not rust. Perfect for products used outside, in states near the ocean, with the high salt content in the air. Fire-retardant resins can make your products stand up against fire and will only char not burn up. Perfect when products will be around corrosive chemicals. Design Freedom: There are very few restrictions with molding fiberglass, giving the engineer unlimited possibilities. Get away from the old boxy looking products and design visually appealing ones that are still as structurally strong and durable. Can take a multi-piece part and convert it into just one. Appearance: Using fiberglass for product covers and enclosures definitely improves its aesthetics. Achieve any look and feel desired. Finishes give fiberglass components a high tech appearance. Cost Effectiveness: With steel being dependent on China’s steel prices, you will have stable prices with fiberglass. Lower costs for maintenance and warranty work. A lighter and stronger product results in lower costs for shipping and storage. Special Characteristics: Fiberglass is non-conductive and radio frequency transparent. Perfect for housing electronics without disturbing their performance and protects employees from hazards inside. Fiberglass absorbs sound waves more than bounces off, thus giving it extremely good acoustics, for lowering machinery volumes and achieving acceptable and/or required sound levels. Unlike metal, plastic, and wood; fiberglass has the least expansion and contraction with heat, cold and/or stress. When exposed to moisture, fiberglass batt insulation neither absorbs nor holds water. If fiberglass insulation does get wet during or after installation, installers should visually inspect it on all six sides for contamination. If the material appears free of visible defects, installers must dry it thoroughly to restore its full R-Value. Once the area surrounding the insulation has also been inspected, cleaned and fully dried, the fiberglass insulation can be reinstalled and will regain its original R-Value. If you have a home with an attic space that you are able to add flooring to, batt insulation is a better choice due to the fact that it is installed between the joists of your attic allowing you to easily add a flooring substrate if you intend to make more use of that space. When we come to your home for your free estimate, our technicians will go over all options with you and see which is the best fit for you, your home and your budget. All in all, we want you to be happy with your purchase as well as the work performed. Give Houston’s Number One Insulation Company a call today and let’s get your home feeling right and your bills reduced!